Outgoing American Vice President Joe Biden once said, “Don't tell me what you value; show me your budget, and I'll tell you what you value.” What would you say the Buhari government values based on its 2017 budget? Narcissistic self-absorption, profligacy, and corruption are some of the things that jumped out at me. It’s now clear to me why the government didn’t punish last year’s budget “padders.” On what moral pedestal would the architects of the 2017 budget stand to chastise or punish the “padders” of the 2016 budget? None. In spite of assurances to the contrary, this year’s budget is even more brazen in its waste, elite insensitivity, egoism, and downright venality than last year’s. All the grand pretenses to “change” have been thrown out the window. I had intended for this week’s column to be a critical review of the budget, but Daily Trust’s reporting on the budget is already so admirably outstanding in its depth and insight that reviewing the budget here would be reinventing the wheel. But few absurdities stuck out like a sore thumb in the budget, and I can’t help calling attention to them. People in Aso Rock obviously love food. When I added up all of the food-related budget allocations in the Aso Rock budget, I came up with N512,457,432. That’s more than half a billion naira just for food for a few people in one year when millions of Nigerians are starving. With that much food, of course, they need a huge outlet for the waste their gluttony would generate, so a whopping N52,827,800 (which is equivalent to N147,733 a day!) has been budgeted for “sewage charges.” You know what “sewage” means, right? Note that in last year’s budget, only N6,121.643 was allocated for “sewage charges.” That's a 763% increase! An Abuja-based industry expert reached out to me after seeing my Facebook status update on the budget and said the "sewage charges" for Aso Rock in the budget were unjustified. "Central Abuja i.e., Asokoro (vicinity of the State House), Maitama, Wuse, Garki, has a modern world-class sewage system where effluent [water mixed with waste matter] is evacuated to 'treatment' facilities, thus ALL properties in this area by law cannot have soak-aways that need to be evacuated every few years," he said. In other words, buildings in Aso Rock don't have external septic tanks/ holes in the ground because the pipes of the central sewage system take the sewage away immediately, as is the case in most/all modern cities. Other puzzling items in the Aso Rock budget are “honoraria and sitting allowances” for the president, the vice president, the chief of staff and sundry Aso Rock workers running into hundreds of millions of naira. 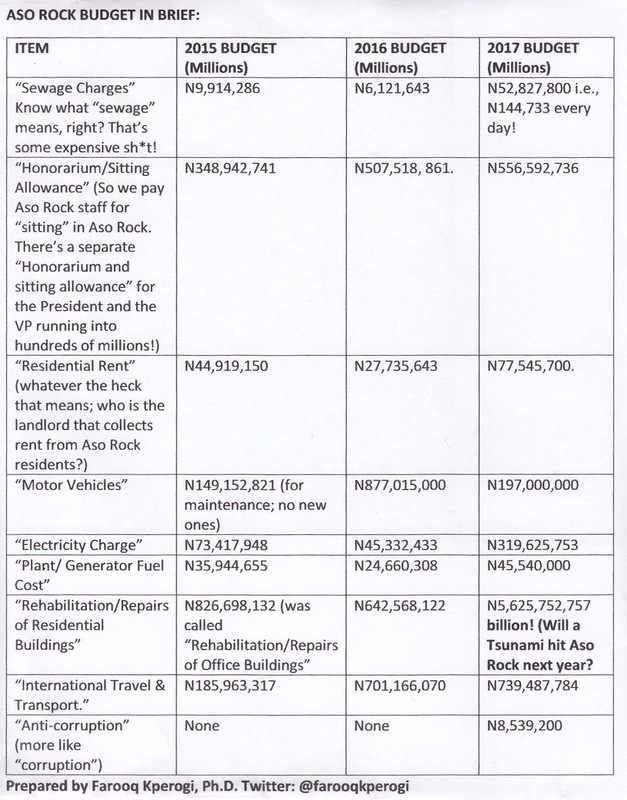 There are unspecified multi-million-naira “welfare packages” for people in Aso Rock. And, apparently, Aso Rock residents pay an annual “residential rent,” which went up from nearly N28 million last year to nearly N78 million this year. However, even though Aso Rock residents are renters, they have budgeted more than N5 billion for the “rehabilitation and repairs of residential buildings” in the Villa. No one who can spend N5 billion to repair a residence should pay N78 million to rent it! 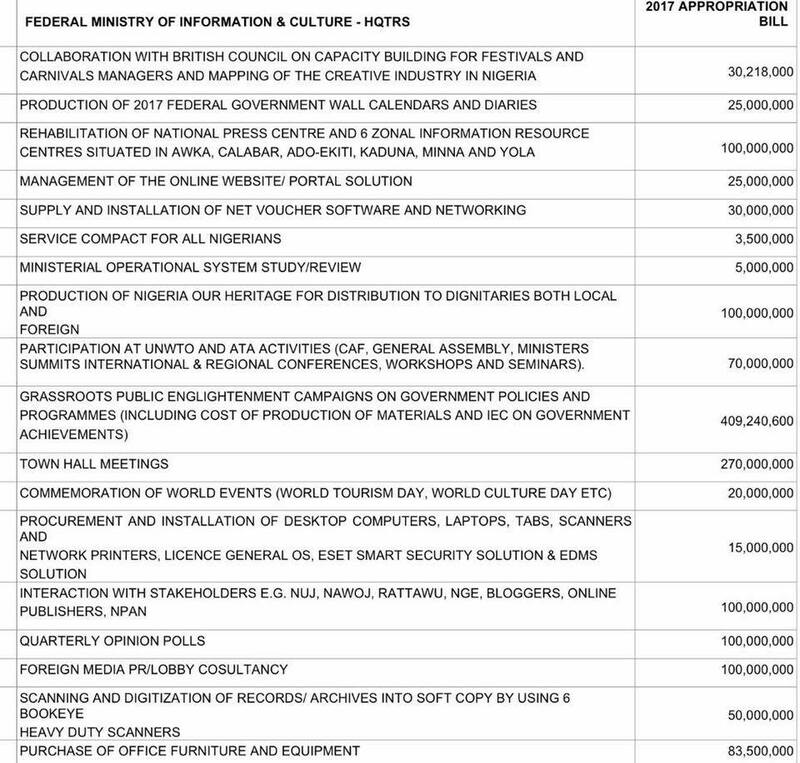 Lai Mohammed, the chief priest of "ChangeBeginswithMe," will spend N409 million for "grassroots enlightenment" next year, N270 million for "town hall meetings," N100 million for "interaction with bloggers," etc., N100 million for "foreign media PR/lobby consultancy" (another word for bribes), and so on. Clearly, "change" hasn't begun yet with the patron saint of "change begins with me." Maybe that's why we haven't heard of the campaign lately. All this extravagance is being proposed in a time of recession, at a time when subsidies have been removed from everyday people, and when poor people are told to "change" and "sacrifice." It's true what they say: government is "legal," organized robbery. People have been asking why I have not “celebrated” the “capture of Sambisa” by our soldiers. First, our soldiers ALWAYS deserve to be celebrated, not just when they capture Sambisa forest. They are our heroes. I have military friends and relatives currently stationed in the Northeast who, along with their brave colleagues, toil day and night under dreadfully difficult conditions to fight a barbarous, bloodthirsty, and nihilistic terrorist group. Some of my mother’s distant maternal ancestors are descended from Maiduguri. When I sent my mother to Mecca on Hajj in 2012, she went through the Maiduguri international airport (in spite of the risks) partly for emotional reasons. Going to Maiduguri was a domestic, emotional pilgrimage for her. But she couldn’t get out of the hotel to enjoy the sights and sounds of a city whose memory she nourishes through the folk songs handed down to her by her grandmother. So the insecurity in Borno—and in the northeast in general—is emotional for me. But I’m frankly puzzled by all the giddy excitement over the capture of Sambisa. I know that we all have a psychic need for some good news, especially in these unprecedentedly difficult times, but the capture of Sambisa isn’t the same as the capture of Boko Haram’s fighters and ringleaders. Nor is it a substitute for rescuing the hundreds of people (just not Chibok girls) in Boko Haram captivity. Or, for that matter, the same as demobilizing Boko Haram since we are not told that their arsenal have been seized. Government is, in fact, now saying that people should be vigilant because Boko Haram fighters are on the loose after their dislodgement. That, for me, is deeply troubling. Chasing a criminal away from the snug hideout from where he used to commit his crimes doesn’t stop the crime; it merely shifts the theatre of the crime. That theater is now wider and more indeterminate. Plus, there are two Boko Haram groups: Shekau’s and al-Barnawi’s. 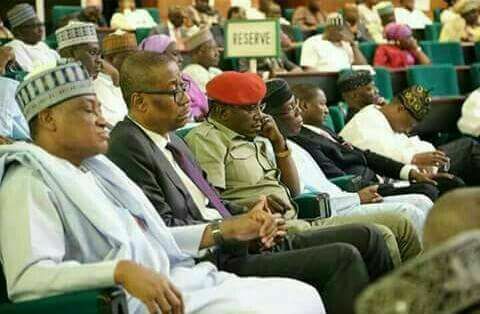 Which one has been dislocated from Sambisa? The publicity around the capture of Sambisa is at best premature and at worst intentional propaganda designed to deflect attention from the unwelcome publicity of the viral videos that trended on social media about the terrible condition of our soldiers on the front lines. In any case, this is the same military establishment that claimed to have killed Shekau at least 5 times, that denied the deaths of soldiers but publicized paying compensation to the families of the soldiers whose deaths they denied, etc. Propaganda and mind management are legitimate in war. I get that. But telling easily falsifiable lies in the service of war propaganda is counterproductive in the long run.